Late last year I met with a small group of billboard company representatives and lobbyists for lunch at a downtown cafe. I knew that Clear Channel and other major billboard companies wanted to make a deal with the city to protect existing digital billboards and allow new ones in exchange for taking down some conventional billboards and giving the city a share of digital billboard revenue. I also knew that the purpose of the meeting was to deliver a sales pitch to me–and by extension, the communities where digital billboards are a hot-button issue–on this idea. The conversation proceeded amiably enough until I said that any discussion should take place only after the California Appeals Court ruled in Summit Media v. City of Los Angeles, the case in which a lower court judge threw out the 2006 lawsuit settlement by the city that allowed Clear Channel and CBS Outdoor to put up digital billboards without any public notification, hearings, or compliance with local zoning regulations. If the court upheld the judge, the permits for the 100 digital billboards now in operation might well be voided, essentially making the signs themselves illegal. That wasn’t what the others around the table wanted to hear. What they wanted was agreement that getting a deal done with the city before the Appeals Court ruled would be in everyone’s best interest. Otherwise, the city would be facing endless rounds of future litigation and related expense, instead of getting rid of conventional billboards blighting neighborhoods and helping to balance the city’s red ink-stained budget. In another communication to the court on July 12, 2012, Clear Channel attorney Margaret Grignon said that “since the spring of 2011, Clear Channel has been conveying its willingness to City Council members to discuss a possibile resolution of this litigation,” meaning the Summit Media case. She further said that Clear Channel had met with the City Attorney’s office to “suggest a potential solution which Clear Channel believes would moot the underlying dispute in this litigation.” In other words, making sure that an adverse ruling from the Appeals Court would have no effect on the existing digital billboards. That suggestion apparently fell on deaf ears, because the City Attorney’s office responded four days later with a letter stating that it was not engaged in any settlement discussions with Clear Channel. That letter, written by Deputy City Attorney Steven Blau, said, “This remains true despite sporadic efforts by Clear Channel to find a willing ear in the city for its overtures.” The letter also pointed out what some lawyers and others following the issue might have considered obvious–that the case could not be settled without the active participation of the party that brought the lawsuit against the city in the first place, i.e., Summit Media. That’s where matters stood, at least publicly, until the Appeals Court announced on Oct. 2 that oral arguments in the Summit Media case would be held on Oct. 30. Eight days later, City Councilmen Paul Krekorian and Ed Reyes introduced a motion to convene a working group including Clear Channel and CBS Outdoor to draft legislation and binding legal agreements that would address the legality of existing digital signs, extinguish the city’s potential liabilities, reduce the total number of signs in the city, and provide public benefit payments. The motion set a deadline of 30 days for producing the legislation and legal agreements. The committees that would normally hold public hearings on such a motion waived consideration, and it reached the full City Council on Oct. 16. There it was amended on the floor, dropping the working group provision and instead directing the city’s Planning Department and Office of Chief Legislative Analyst to draft the legislation and legal agreements. The motion carried by a vote of 11-3, the nay votes by councilmembers from districts where almost all the 100 digital billboards are located. At this point, one could reasonably conclude that Clear Channel, et al, had succeeded in getting the plan discussed at that downtown lunch before the council. 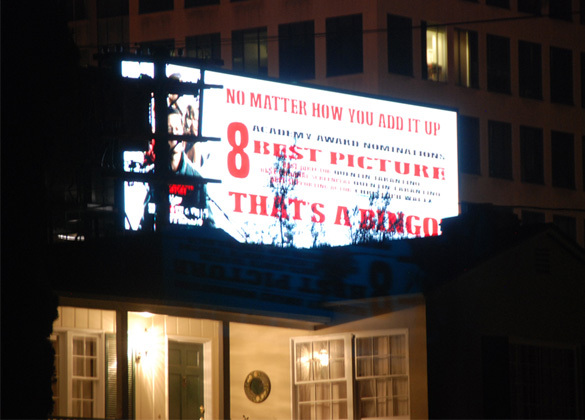 One might also assume that the haste with which it was presented had everything to do with the Appeals Court schedule and the very real possibility of a ruling that would jeopardize the 100 digital billboards. In fact, the motion says, “It is critical that the City act now–before any Court of Appeal ruling…” although the reason given–that the court might uphold the 2006 agreement and affirm the legality of the digital billboards, thus removing any incentive for the billboard companies to cut a deal with the city–makes no sense. If the billboard companies really believed they might win in court, why would they work so hard to make a deal involving revenue sharing and other benefits? Almost all legal observers were predicting the opposite outcome, and in fact, at the Oct. 30 oral arguments the presiding judge delivered a tentative ruling upholding the lower court judge and saying the court was inclined to order the revocation of the digital billboard permits issued thus far. That tentative ruling hadn’t been made by the time of the Oct. 16 council meeting, but everything else pointed to the fact that the Krekorian/Reyes motion looked like a blueprint for exactly what the billboard companies had been seeking. Despite that, Krekorian, Reyes and several other council members were at pains to argue that community activists who had raised the alarms about the motion had gotten it all wrong. It had nothing to do trying to dodge a court ruling and making sure the digital billboards stayed in place, but was only intended to start a “conversation” and “dialogue” about digital billboards. What could possibly be insidious about that? Krekorian repeatedly assured his colleagues that there would be public input into drafting of the legislation and legal agreements, although the motion as amended only states that city staff will “outreach” to the city’s seven neighborhood council alliances and that neighborhood councils themselves will be “notified” when the drafts are complete. Krekorian also stressed that full public hearings on any legislation and agreements would be held by the city council’s Planning and Land Use Management (PLUM) committee and Budget and Finance committee. It’s useful to know that Reyes is chairman of the PLUM committee and Krekorian is a member, and that Krekorian is chairman of the Budget and Finance committee. The City Planning Commission, which has jurisdiction over citywide signage issues and has held extensive hearings in the past on billboard matters, is conspicuous by its absence from this route apparently designed to move the legislation to the city council floor with as little delay as possible.But is that even possible? Alan Bell, the city’s Deputy Planning Director, was quoted in the L.A. Weekly as saying that the planning department can’t possibly comply with the 30-day deadline specified by the Krekorian/Reyes motion. The Chief Legislative Analyst’s office hasn’t made any public statements, but there is another glaring question that hasn’t been answered, and that’s why the City Attorney’s office isn’t even mentioned in this process. Do the motion’s supporters actually intend to produce complex regulatory legislation and binding legal agreements with billboard companies without any review by the office that has been on the front lines of the billboard legal wars and successfully defended the city against legal attacks, some by the very companies that are pushing for a digital billboard deal? Apparently so. And it doesn’t take any gigantic leap of imagination to think that the Clear Channel attorneys who have been writing letters to the courts and lobbying city council offices have already written drafts of the legislation and legal agreements called for in the motion, and all that remains is the imprimatur of the planning department and Chief Legislative Analyst and then a quick sail though the two committees and a majority vote of the City Council. In a Facebook posting shortly after the Oct. 16 city council meeting, Krekorian used such terms as “extremism” and “screeching voice” in reference to those who have called his motion an attempt to make some kind of end run around the legal process and keep the digital billboards that have been plaguing the neighborhoods where they are concentrated, almost entirely on the city’s west side. He has also strenuously denied any suggestion that he and Reyes are doing the bidding of the billboard companies, even though the L.A. Times has reported that a Clear Channel lobbyist drafted the original motion and brought it to Councilman Reyes’ office. And he has strongly denied that the legislation and legal agreements called for in his motion would lead to more digital billboards in the city. With due respect to the Councilman, Clear Channel has made it perfectly clear that it is willing to take down some conventional billboards and give the city some revenue if it can keep its digital billboards. Most of those 100 billboards belong to Clear Channel, the rest are owned by CBS Outdoor, which would certainly get to keep its signs as well. Then there is Lamar Advertising, Regency Outdoor, Van Wagner Communications, and Summit Media, none of which have digital billboards now but obviously would have to be invited to the party, because one of the complaints in the Summit Media lawsuit was that the city unfairly handed a highly lucrative entitlement to just two billboard companies. It doesn’t take a math whiz to figure out that a deal allowing Clear Channel and CBS to keep their 100 digital billboards would ultimately result in an increase over that number–to 120, 150, who knows? Until the councilman can provide some real evidence that the “extremists” and “screeching” voices are dead wrong about all this, people should be advised to keep believing it.